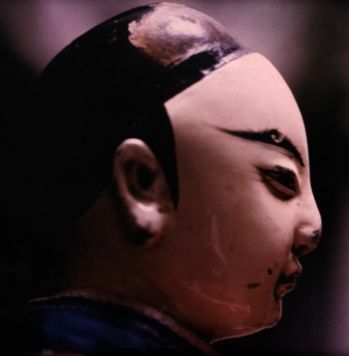 Chinese Opera and Puppets have always been closely related art forms. Glove puppets were originally from Fu Jian, and are deemed to go back to the 16th Century, when the first satirical plays criticising Wei Zhongxian the ennuch appeared (1527). Basic to begin with, this art form became, with the centuries, a form of miniature Chinese Opera with all the characteristics inherent to this form : a complete spectacle with songs and acrobatics where drama and farce intertwine. If glove puppets attained to the highest refinement, it is due to their sacred context. They were most often used during religious celebrations, to entertain the gods. A puppet show cost much less than an opera, and people resorted to them for self-evident economic reasons. Yet puppeteers elaborated an art form just as refined as actors' theatre. They went so far as to adopt names clearly linking them with full-sized theatre in order to ensure the gods forgot that they were 'only' puppets. A case in point is the name of the Yi wan Jan company, which translates as "absolutely similar"... to real theatre. Another example : certain puppets wear underclothes which are not visible, just like real actors, but clearly signifying their standing as "real" actors. In this permanent hall of mirrors, puppeteers have developed a genre which, while staying close to Opera, is not simply a copy in miniature, but a fully-fledged art form which has found its own self-definition. This particular type of puppet which is specific to Fu Jian and is called zhang zhong xi in Taiwan (palm theatre) or bu dai xi (cloth pouch theatre), because the central part of the puppet is a sort of little pouch into which one slips one's hand. Bu dai xi is deemed to come from the Indian 'putali' which meant 'puppet' in the vernacular languages of the Indian sub-continent. It is undoubtedly through the long-established sea trade with this region that this type of puppet arrived in Fu Jian. It is impossible to mention puppets in China without speaking of the Opera. The reciprocal influence of puppets and theatre is ongoing. However, it is thought that the puppet theatre was established before theatre proper. Its source is thought to be in the statuettes used in funerary rites. With time, as often happens, a passage from ritual to spectacle took place. We can trace this same phenomena as far as France, where the word "marionette" comes from "Marie". Dolls were used in the Middle Ages to represent the Holy Virgin in little sketches played out on the plazas in front of the churches. This, apparently, is the origin of the word "marionette". It is even thought that puppets were at the origin of actors' theatre in China. Certain leads would seem to support this theory: for example, an opera actor always refers to a puppet player as "Master". In another example, actors who are waiting to go on stage say they are "hung"(gua), just as one hangs a puppet between scenes. It also seems that the gestures of the Chinese opera actor are directly inspired by the movements of puppets, and likewise that the very accentuated makeup of the actors is a survival of the painted heads of puppets.